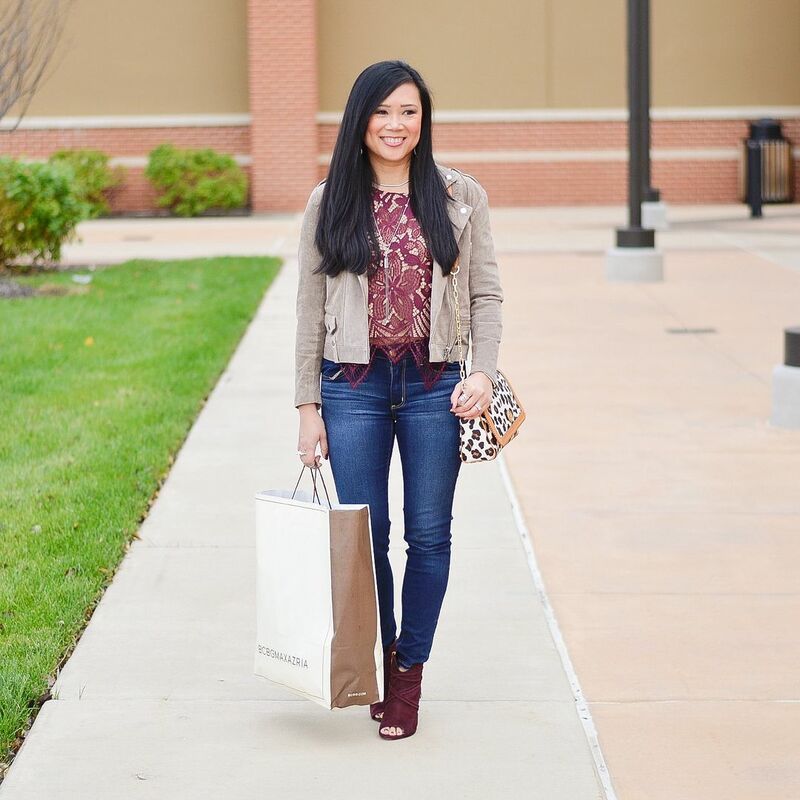 Jacket: Capulet (c/o Shopbop) (cheaper option here, budget option here) | Necklace: Charming Charlie | Bag: Tory Burch | Top: Express | Bottoms: American Eagle | Booties: Vince Camuto "Astan"
On Monday, I shared the goodies I #FoundAtSimon during the St. Louis Premium Outlets Joy of Giving blogger event. If you missed it, you can catch yourself up here. I'm working a little backwards by sharing my outfit for the event after the fact. But, there were other fun things that happened that day that needed to be blogged! So let's get started! 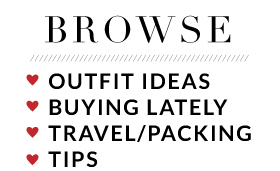 As with other blogger events, I agonized over this outfit. The challenge was finding something cute, something warm (ish), and something (i.e. shoes) comfy enough to walk around an outlet mall for a couple of hours. I remembered this flat lay I posted here and thought it would be perfect! Instead of the Rockstuds, I went with my new peep toe booties I ordered for Black Friday! I've been itching to take them out for a spin because they are absolutely delish! I was a little worried my feet wouldn't last in them. I usually have a stock of Foot Petals on hand at any given time, but I didn't have any extras to use for these booties. I went ahead and took the gamble and wore them anyway. My feet lasted just fine, actually! My day started at 8am and I wore them all day at the outlet mall, then the regular mall, and I didn't end up taking them off until 5pm. I definitely give these booties two thumbs up in terms of comfort. So yeah. 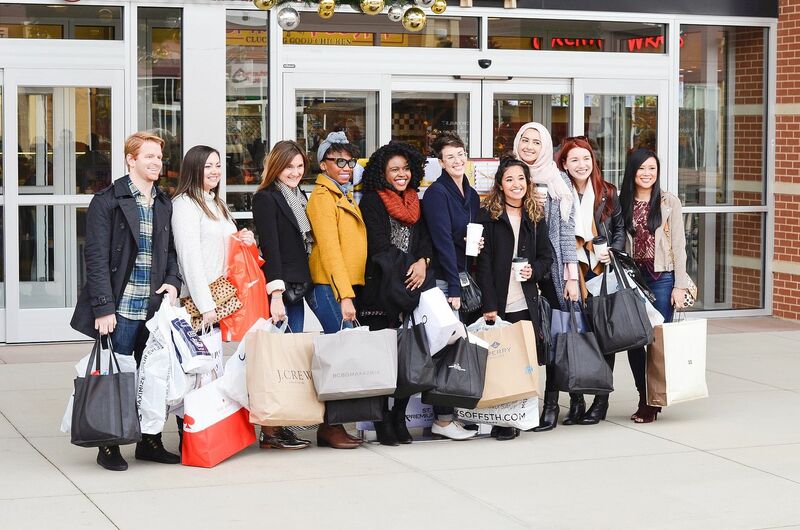 My day started with an amazing shopping spree at the outlet mall alongside a few other local bloggers. Luckily, the husband agreed to be my chauffeur so I didn't even have to drive! Extra bonus! 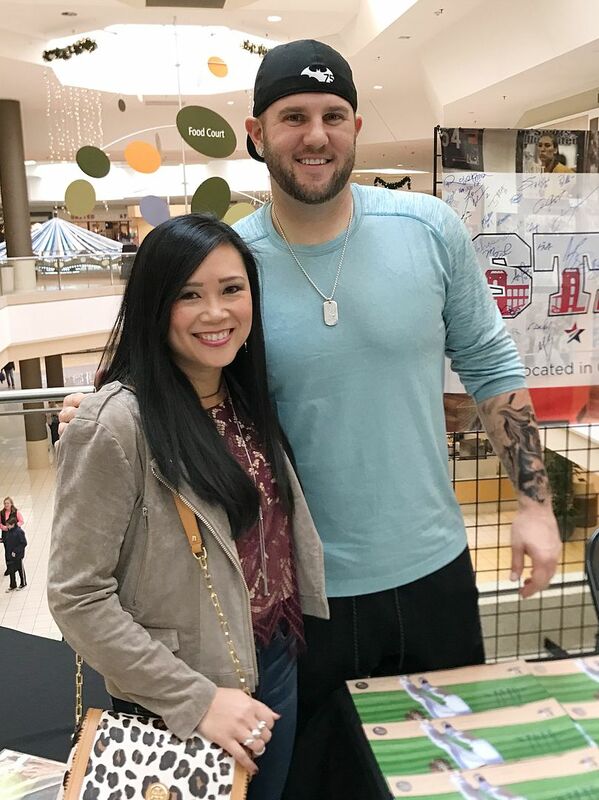 I happened to see that one of my favorite Cardinals was doing a public signing. The outlet mall is about 45 minutes from our house, and the public signing was in the same area, so naturally, I had to kill two birds with one stone and go! I'm starting to become a groupie here considering I just went to another signing a couple of weeks ago! I mean, how cute is he though?! He's an amazing first baseman with an even more amazing bat! AND he said the spelling of my name is "awesome." Yep, awesome. I was over the moon excited, and I'm thankful that the husband doesn't mind me being his crazy fangirl wife that I am! I love baseball. Hurry up, opening day!!! Soooooo, then! We decided to buy a new truck. Yeah, that escalated quickly. Last week when my family was here, the husband was talking about our "car plan" which basically consisted of trading in my Saturn Vue and what car I would get once the lease was up on my Audi. He mentioned wanting to buy a truck, and I knew that the second he started looking, it would be a matter of days before it was sitting in our garage. He's quite excited about it, and I do like it a lot myself. IT HAS ADJUSTABLE FOOT PEDALS!!! I miss having adjustable foot pedals like my Ford Explorer had. I was so excited to see this truck had them too, especially since it's such a big vehicle! It such a life saver for this shortie! You had a great Saturday indeed and that outfit is so cute. I love these lace tanks. Well your weekend put mine to shame! LOL. Sounds like it was action packed with all the best kinds of things. And your outfit was just perfect! What a busy day! 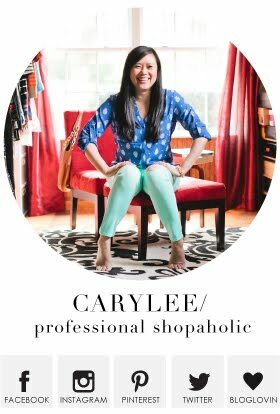 I am so impressed you lasted so long in those booties. Adorable and comfortable! It's a double win! I agree with Gina! What a weekend! Nate wants this truck. For real though. On another note, those booties and lace top are everything! I saw that top in store and should have tried it on because it's beautiful. Congrats!! That's so funny! My hubby wanted to buy a truck at Laura this weekend but for some reason they couldn't locate it LOL! 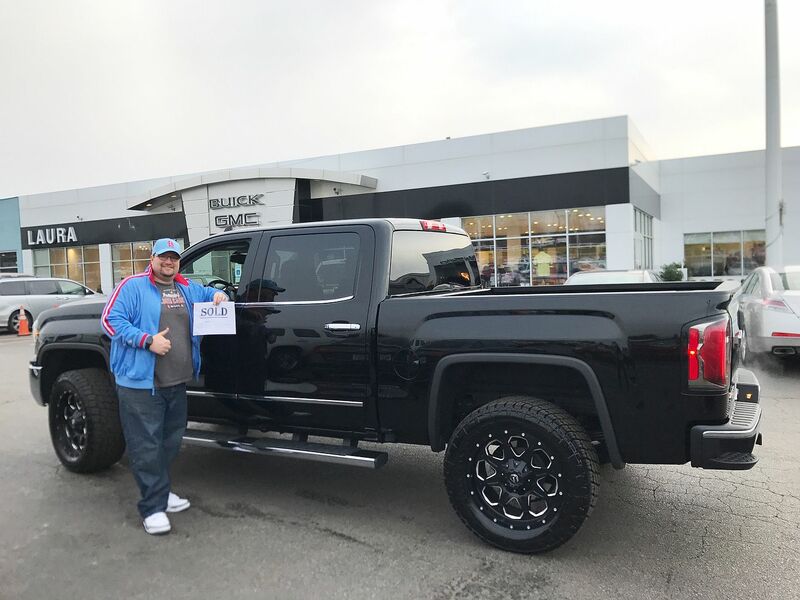 We ended purchasing a 2017 Denali truck in Louisville on Monday, same truck only in white. It is so fancy we are calling it the pinky-up truck, not pick up truck. It's like a top of the line car with all the bells and whistles disguised as a truck. He still has the same look on his face even today as your hubby does in your pic.